It’s another crazy chapter, more laughs, more twists, and a few guest stars tossed in for good measure. How can you not love this book? Damien finds himself pushed to the breaking point by having to deal with Superboy Red and Superboy Blue, each trying to be more noble than the other. The story picks up from the end of the previous issue, with Space Cabbie giving them and Joker Jr a lift. My gosh I love this book. I know I say that in every review, but it’s true. The laughs never stop coming, but at the same time there is a strong plot line to carry the story, and genuine surprises along the way. 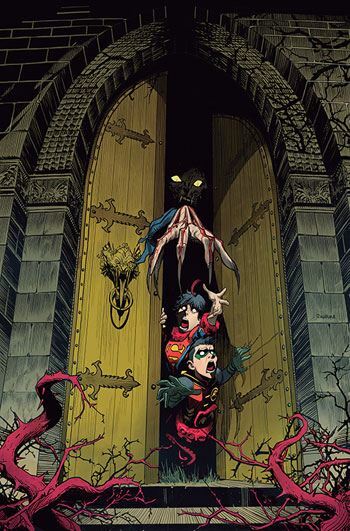 I also have to call attention to Mora’s wonderful cover, a take off of the cover of the first House of Mystery issue after the book switched from science fiction stories to horror ones. Even though Rex Luthor and his band of minivillains have been left behind by the heroes, they remain a part of the storyline. Thanks to the Joker Jr, we learn a bit more about Rex’s schemes. Tomasi and Barberi have really hit their stride on this book. I really hope that, once the miniseries is over, the Super Sons return in an ongoing monthly. This is far too much fun to end.